Sandmeyer Steel Company stocks Alloy 904L stainless steel plate in thicknesses from 3/16" through 2". Alloy 904L (UNS N08904) is a superaustenitic stainless steel designed for corrosion and pitting resistance in a wide range of process environments. It is used extensively in the chemical process industry including the production of phosphate-based fertilizers. With its highly alloyed chemistry — 25% nickel and 4.5% molybdenum, 904L provides good chloride stress corrosion cracking resistance, pitting and general corrosion resistance superior to 316L and 317L molybdenum enhanced stainless steels. The high content of alloying elements in 904L gives the alloy exceptionally good resistance to uniform corrosion. 904L was originally developed to withstand environments containing dilute sulfuric acid, and is one of the few stainless steels that, at temperatures up to 95°F (35°C), provides full resistance in such environments within the entire concentration range of 0 to 100%. 904L also offers good resistance to a number of other inorganic acids, such as phosphoric acid and most organic acids. However, acids and acid solutions containing halide ions can be very aggressive, and the corrosion resistance of 317L, 317LMN and 904L may be insufficient. Fractional distillation of tall oil often needs better material than 316L or even the more frequently used 317LMN. In these hot concentrated caustic solutions, the corrosion resistance is mainly determined by the nickel content of the material. With a nickel content of 25%, 904L has proven to be a good alternative to most conventional stainless steels. 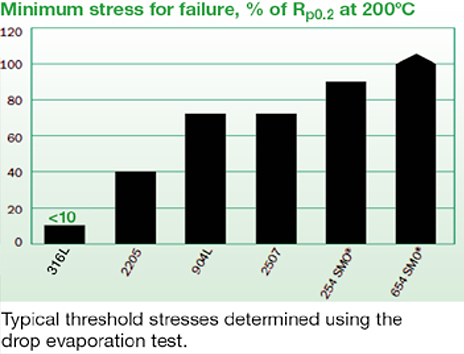 Conventional stainless steels such as 304L and 316L are susceptible to chloride stress corrosion cracking (SSC) under certain conditions. Resistance to SSC increases with the increased content of nickel and molybdenum. Therefore, the higher performance austenitic stainless steels such as 904L have very good resistance to SSC. The table in the upper right corner shows resistance to SSC in a chloride solution under evaporative conditions. High performance austenitic steels and duplex stainless steels clearly outperform 316L. *Composition: 20% HNO3 + 4 HF. Alloy 904L can be easily welded and processed by standard shop fabrication practices. Working temperatures of 1562 – 2102°F (850 –1150°C) are recommended for hot working processes. Normally hot working should be followed by a solution anneal and quench, but for 904L, if hot forming is discontinued at a temperature above 2012°F (1100°C) and the material is quenched directly thereafter, the material may be used without subsequent heat treatment. It is important that the entire workpiece be quenched from temperatures above 2012°F (1100°C). In the event of partial heating or cooling below 2012°F (1100°C), or if the cooling has been too slow, hot working should always be followed by a solution anneal and quenching. 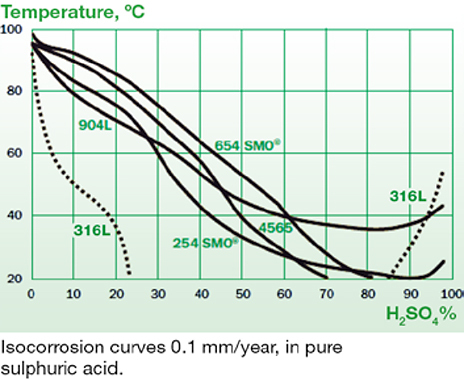 904L should be solution annealed at 1940 – 2084°F (1060 –1140°C). The cold work hardening rate of Alloy 904L makes it less machinable than 410 and 304 stainless steels. Alloy 904L can be readily welded by most standard processes. Austenitic plate materials have a homogeneous austenitic structure with an even distribution of alloying elements. 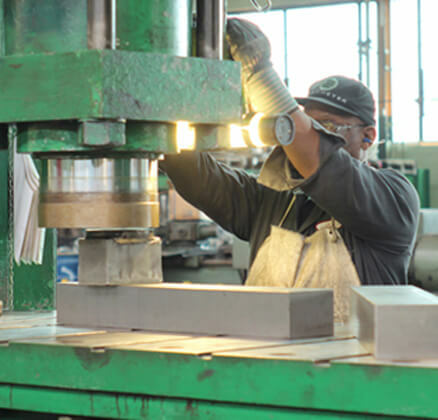 Solidification after welding causes the redistribution of certain elements such as molybdenum, chromium and nickel. These segregations remain in the cast structure of the weld and can impair the corrosion resistance in certain environments. Segregation is less evident in 904L, and this material is normally welded using a filler metal of the same composition as the base metal and can even be welded without filler metal. The welding consumables for 904L are 20 25 CuL covered electrode and 20 25 CuL wire.